As we age, our skincare needs evolve. That doesn’t mean we won’t have the occasional breakout in our 30s. But internal and external factors change the reality of our skin. “As women age, estrogen levels decline and our skin begins to thin, all of which can result in sagging skin and wrinkles,” Karen Behnke, the founder of Juice Beauty, told me. It’s no secret that younger skin is much tighter and firmer, containing a lot more collagen than the average 50-year-old skin. Still, we can all get a healthy, glowing complexion at any age if we use the appropriate skincare products. At What Age Should You Start a Skincare Routine? 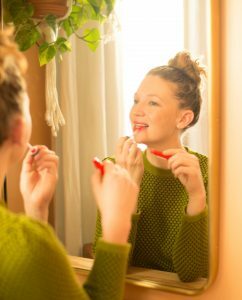 “We start out in our teens dealing with breakouts and hormones, so we focus more on blemish clearing ingredients,” Behnke noted. Then, as we age, we shift to treating environmental and sun damage, as well as fine lines, wrinkles, and the signs of dehydrated skin. The number of skincare concerns may grow as we celebrate more birthdays. But I wanted to know: at what age specifically should we get serious about a skincare routine? You should start a proper routine in your early 20s, according to Behnke. Very early in life (we’re talking toddler years), you should start using a reef-safe, baby-safe zinc mineral SPF sunscreen. But, as Behnke told me: “Starting a more comprehensive skincare regimen that includes cleansing, treating, and moisturizing, should really being in your early 20s.” Don’t worry. If you’re like me and at least a decade past that, It’s never too late! No matter your age, using great skincare will fuel your skin with the nutrients to promote healthier looking and glowing skin, according to Behnke. The best way to do that is by using products best suited to treat the concerns of your specific age range. Behnke broke it down for us, sharing the skincare products and ingredients she recommends for your teens, 20s, 30s, 40s, 50s, 60s, and beyond. 20s — A Powerful Moisturizer As we move out of our teens, our skin likely looks pretty good! Not too many wrinkles or acne, if we’re lucky. To keep that momentum going in your early 20s, try a moisturizing product like Juice Beauty’s Prebiotix Hydrating Gel Moisturizer. It can help protect the skin’s microbiome, while enhancing necessary hydration to help with age defying goals. Behnke also said it’s great for combination, normal, or dry skin. “For younger skin, this moisturizer is great to use twice a day, and wonderful for those with an active lifestyle,” she added. “In your 30s, it’s important to add stronger age defying products to your skincare regimen,” Behnke explained. 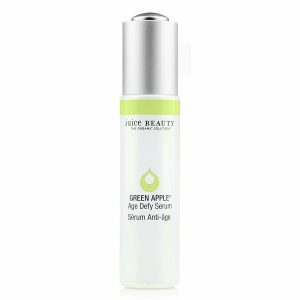 She says Juice Beauty’s Green Apple Age Defy Serum is the perfect serum for your 30s because it helps create a brighter-looking complexion. “Since it’s rich in antioxidants, this product will help reduce free radicals that may contribute to the appearance of aging,” she said. 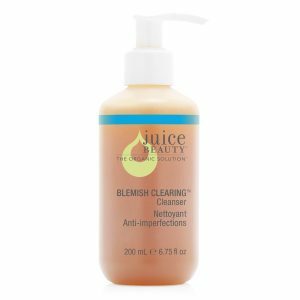 Behnke told me that Juice Beauty has clinically tested the organic serum, too. “The Green Apple Age Defy Serum performed on average 2.7 times better at antioxidant protection than a well known conventional serum and a natural serum.” She said that’s because organically-farmed ingredients have higher levels of antioxidants than conventionally-farmed ingredients. In your 50s, you want active ingredients that will improve your skin in various ways. 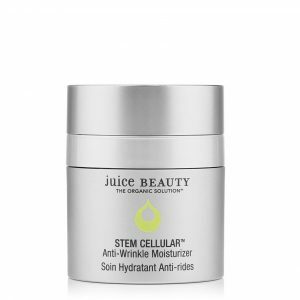 Look no further than Juice Beauty’s Stem Cellular Anti-Wrinkle Booster Serum. 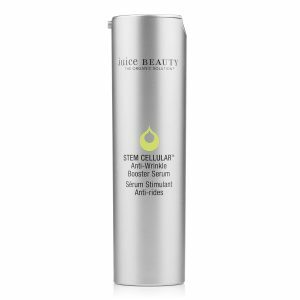 “It’s power-packed with an optimum dose of Juice Beauty’s proprietary blend of fruit stem cells and Vitamin C infused into resveratrol-rich grapeseed formula,” Behnke said. She promised it will improve skin tone and luminosity while antioxidant-rich jojoba and shea deliver intense hydration. 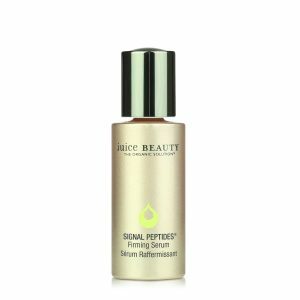 Juice Beauty’s Signal Peptides Firming Serum was created for those who want a high-performing formula to use day or night. Behnke says the patent-pending formula addresses loss of firmness and elasticity, two concerns you may confront in your 60s. “I actually sometimes forget to follow this serum with one of our moisturizers as it is so hydrating,” she told me. It’s also been clinically validated. 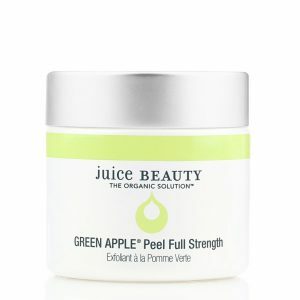 This patented Green Apple Peel Full Strength Exfoliating Mask is the ultimate face peel delivering spa-grade exfoliation, according to Behnke. It’s packed with AHAs, BHAs, and organic fruit acids such as malic acid from organic green apples. Those ingredients can reveal a brighter looking complexion. They also reduce the appearance of fine lines and wrinkles, as well as dark spots and discoloration. “Patented, best-selling, mega results,” Behnke concludes. Sign us up.